C.F. Andrews (left) and W.W. Pearson in South Africa, c. 1913. C.F. Andrews, February 27, 1927. "With kindest regards - in. mem. Feb. 24 - 27., 1927 - C.F. Andrews". C.F. 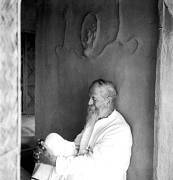 Andrews in Mahatma Gandhi's hut at Sevagram Ashram, 1939. C.F. 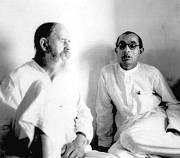 Andrewsand Pyarelal Nayar in Mahatma Gandhi's hut at Sevagram Ashram, 1939.